(Hybrid Wichurana 1930) - Large pale pink flowers are produced repeatedly on a climber, which will r.. Vigorous upright growth. Well formed classical buds of rich dark red. Highly fragrant. .. Vigorous sport of the well known and popular 'Peace'. Double yellow, flushed pink blooms. 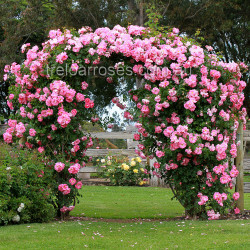 Repeat flo..
One of the most popular climbing roses. Also known as Eden Rose. White to pale pink blooms deepening..
Clusters of candy-pink flowers cover this climber of manageable vigour all season. Bright green, glo..
(MEIdrason) - This climber produces masses of large, burgundy red, very double, cupped blooms with t..
Large clusters of very fragrant open double pink blooms. Healthy glossy foliage. Repeat flowering. ..
(Ausbaker) - A very refined rose of delicate beauty. The yellow flowers are of a pleasing cupped for..
(Ausmove) - Large, fragrant flowers of bright crimson. Deeply cupped during the early stages, the ou..
(Ausjosiah) - The large blooms of soft rose pink, have a delicate, almost gossamer-like quality with..
Large double blooms of a rich creamy apricot, scalloped in an 'old world' style. Plentiful light-gre..
Clusters of semi-double, violet blooms with white highlights and yellow stamens accompained by a swe..
(1950) - Huge clusters of apricot buds opening to single creamy-yellow flowers which quickly fade to..
Large blooms in colourful tones of gold to copper orange provide a magnificent display. Recurrent fl..
(Auswill) - A tall shrub with attractive, arching growth. The apricot-pink flowers are of a formal r..
(Ausblanket) - One of the most fragrant David Austins. This attractive rose produces plump buds with..
(Bourbon 1868) - A tall climber with a 4m spread or a large shrub. Large blooms with a strong damask..